Impact investing is increasingly expected to close a looming funding gap to achieve the United Nations Sustainable Development Goals (SDGs). 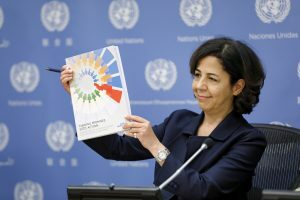 According to the U.N., achieving the SDGs by 2030 will require a total global spend of $5 trillion to $7 trillion, with an investment gap in developing countries of about $2.5 trillion. But how do the investors who are willing to step up to the plate know that their money is driving real impact? According to Ethan Powell, CEO of Impact Shares, the fund is designed to provide exposure to companies worldwide with strong policies and practices relative to the SDGs that are actively engaged in the world’s poorest countries, known also as the 47 Least Developed Countries(LDCs).